Nusrat Tabassum wins 2nd place at the New York City Science & Engineering Fair! A big congratulations to Nusrat Tabassum! She beat out 32 other competitors to win 2nd Place in the Microbiology Category the New York City Science & Engineering Fair. 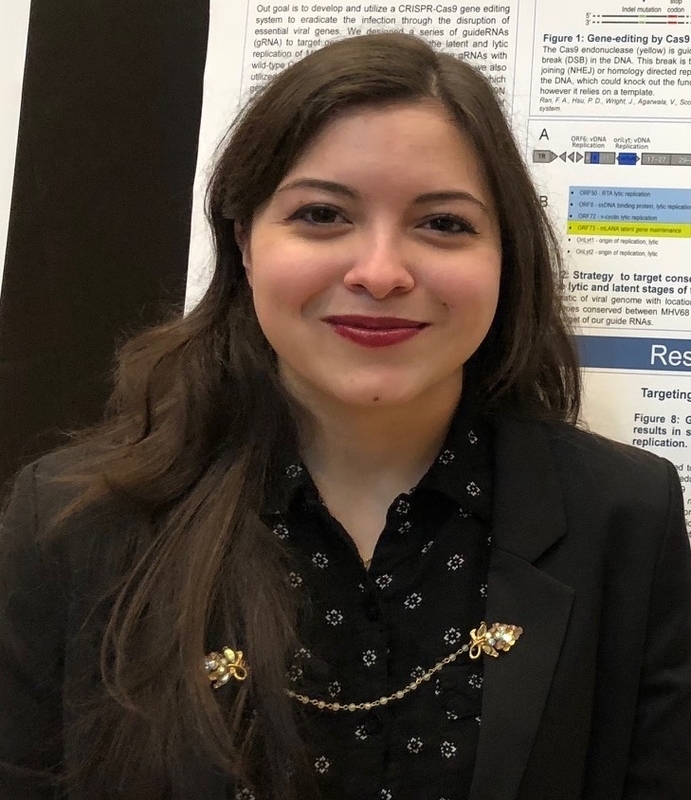 Her project “Investigating the Binding Affinity and the Dimerization Behavior of the Homeodomain-like Domain Protein PfHDP1” was the result of two summers in our lab working with Riward. Nice job Nusrat ! Congratulations to our ACCESS summer research student Gabrielle Paniccia for her presentation award at the 2018 ABRCMS meeting. Nice Work Gaby! We've got some great students in the lab for the summer! Gabrielle Paniccia is a rising senior studying biochemistry at Stony Brook University and Nusrat Tabassum is back with us for her second summer before starting her final year at the Bronx High School of Science. NIH funds project investigating how malaria parasite can respond to changes in their environment. We just received our Notice of Award for a joint R01 between the Deitsch and Kafsack Labs. I'm super excited about this project and we are looking to hire two post-docs ASAP. Click here for details if you are interested. Racking them up and knocking them down! Keep it up Chrischi! Kafsack Lab awarded Bohmfalk Trust Research Grant! Exciting project to identify small molecule inhibitors of gametocyte development starting this fall. Our Single Cell Study Wins 2018 Julian Rachele Prize! Chrischi and Asaf were selected as co-recipients of the 2018 Julian R. Rachele Prize for our Nature paper, “Single-cell RNA sequencing reveals a signature of sexual commitment in malaria parasites." This award recognizes the best paper by a Weill Cornell/Sloan Kettering Ph.D. student published in the past 12 months. Well deserved recognition for two great young scientists! Summer Student Scott Segura accepted to Grad School! He'll be getting his PhD at University of Texas, Medical Branch in Galveston. I'm so proud to have awesome students like her in my lab! BAEF Fellow Leen Vanheer joining the Kafsack Lab! Leen is currently finishing her medical studies at KU Leuven and will be joining the lab this fall. She was awarded a highly competitive Research Fellowship from the Belgian American Education Foundation. Great to have you on the team, Leen! Kafsack Lab receives Discovery Award from DoD! Working together with Dr. Laura Kirkman also here at WCM, we will be using our single cell approaches to probe the mechanisms of malaria drug resistance. Our first paper came out in Nature today! 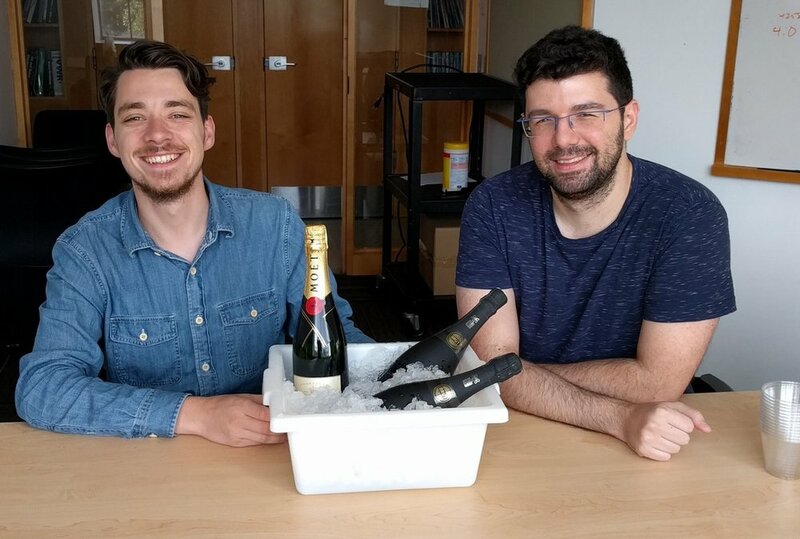 CHRISCHI AND ASAF CELEBRATE OUR PAPER'S ACCEPTANCE. Xinran & Chrischi present at NYC Parasitology Meeting. Chrischi gave a very well-received* 20min talk on our single cell sequencing efforts and Xinran got to show off the many flow cytometry assays she implemented and optimized this past year. Hello, Goodbye, and Congratulations Randy! We were sad to say goodbye to Randy Coupet, our visiting medical student from the Universite de Bordeaux. He was a delight to have in the lab and we're sure that he'll go on to great things. Congratulations on completing medical school Randy! If you ever get bored of saving lives, you can come back anytime!